This is one of the opening lines to “The Minutemen”. A much younger Hollis Mason is holding the very object that will ultimately be fatally used against him. Mr. Mason is trying to finish the ending to his book “Under The Hood” in the opening scene, and we are off and running with the much anticipated (or dreaded) Watchmen prequels. I will say that Watchmen is one of my all time favorite graphic novels. I’ve bought it countless times and in countless formats (single issues, trade paperbacks, and Absolute editions). I will admit that I was one of the skeptics when these series were announced. I asked the same questions everyone else did: “What can you possibly add to the greatest superhero story ever told?”, “How can DC screw with the “Bible” of modern comics?”, “Is DC so bereft of new ideas that they have to pull this publicity stunt?” Well fellow readers, I’m here to calm your nerves like a shot of whiskey. This first issue was great. I truely did not know what to expect, but this first book delivered. First, let’s talk about the story itself. 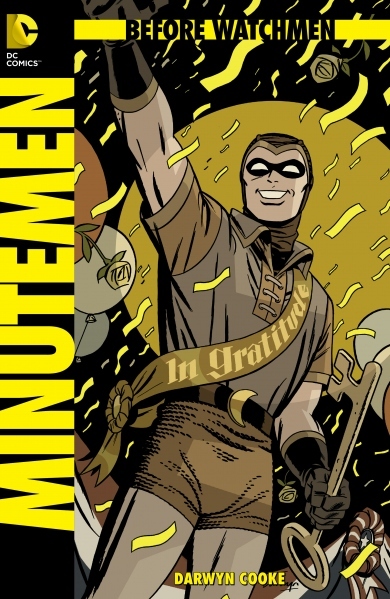 Minutemen is the origin of the team you see in Watchmen. Not the team with Dr. Manhattan and the other main characters, but the original Minutemen – the first Nite Owl, the first Silk Spectre, The Comedian, Captain Metropolis, Dollar Bill, Mothman, Hooded Justice, and the Silhouette. We see a few of these characters in the original Watchmen (Hollis Mason, Sally Jupiter, and Edward Blake), but we never really see any of them in their prime. That’s what this story is all about; the team coming together. Think of this as a “Year One” for the Watchmen Universe. The original team is really a blank canvas. We know almost nothing about them. We know there’s history between The Comedian and The Silk Spectre, but other than that, there’s nothing. This is all new material. Now, let’s talk about the creator on this book. I could not have picked a better person to write or draw Minutemen. Darwyn Cooke’s style is a perfect match. His retro art fits seamlessly into the book. You can tell he is paying homage to the work that Alan Moore and Dave Gibbons did way back in 1986, all the while doing his own version of the characters. Because these back stories have never been told, he really gets to start from square one with all of them. He is more than talented enough to kill it on this book. With all of the attention going towards The Minutemen, I didn’t want to leave out the back-up story titled: The Curse of the Crimson Corsair. The back-up is written by legendary comic creator Len Wein (Swamp Thing, The Justice League, and The X-Men) and the original Watchmen colorist John Higgins (Judge Dredd). This two page back-up is a throw back to Tales of the Black Freighter which was the story that ran inside Watchmen. The Crimson Corsair itself was fine. Nothing spectacular. You’re introduced to the main character by the name of Gordon McClachan as he joins a British Navel Ship. Again, nothing really mind blowing, but I feel like when you read all these little back-ups together, you will get a pretty cool story. All that being said, The Minutemen is a great read. I really like how it’s started, and it has me interested to see where it goes from here. If you’re a fan of the Watchmen universe, then I really think you will dig this. Do yourself a favor and swing by All American Collectibles at 6933 Hampton Ave., pick up your copy, and tell ’em Joe sent ya! Please feel free to leave your thoughts and comments below. I would love to hear what other people thought about this book. Also, you can hit me up on Twitter at @JoeyButts21.